Mainland Australians often joke about going “overseas”–to Tasmania. For sometimes Tasmania seems to be to Australia as Australia is to the world: a distant and different island culture. 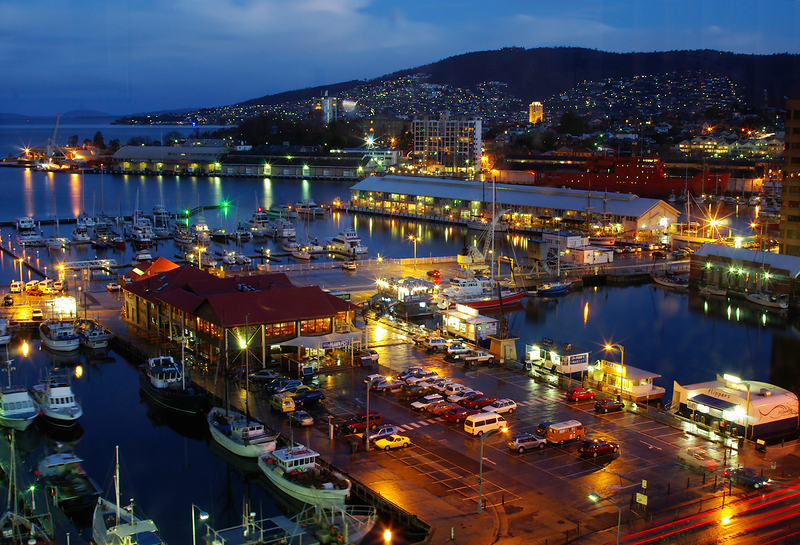 Hobart, the capital of that different, distant state is a riverside city whose cooler climate and low-rise buildings offer, more than any other Australian capital, the impression of a compact European city. With its mountain backdrop and the water aprons of the Derwent River, it appears a comfortable community, secure in its location and the comfortable size of its population of 215,000. The first attempt at settlement was made in 1803 at Risdon Cove, about eight kilometres (five miles) from the present town. Tasmania was then known as Van Diemen’s Land; it was to this remote corner of the British Empire that Governor King sent Lt. John Bowen with a party of 35 convicts and 10 officers to establish a penal settlement. Risdon Cove proved unsuitable, so in 1804 the settlement moved downstream to the site of today’s Hobart. The hamlet of 433 dwellers was named after Lord Hobart, the Secretary of State for the British colonies. The civil tranquillity of modern Hobart belies the fact that it and its neighbouring settlements were once the dumping grounds for some of the worst of Britain’s criminals. When Governor Macquarie arrived in 1811, he was horrified at the disorderliness of Hobart and immediately drew up a plan to make the place more attractive by the offer of free land grants, loans and cheap convict help for free settlers. Macquarie’s initiative helped open up the fertile farming district of the Derwent Valley. It was not long before Hobart’s wharves were busy loading wool bales and cargoes of grain bound for Britain. The Derwent became one of Australia’s most significant ports, with Yankee whalers and sealers using it as a base to launch expeditions into the Pacific and Southern Ocean. Hobart’s early days as a sailing port are fittingly remembered each 26 December when a fleet of racing yachts leaves another great port 1,000 km (620 miles) north for the Sydney-Hobart Blue Water Classic. In places the river is up to two kilometres across; straddling the expanse is the graceful arc of the Tasman Bridge, showing few scars of the 1975 tragedy when it was struck by a ship, causing the roadway to collapse killing a dozen people. 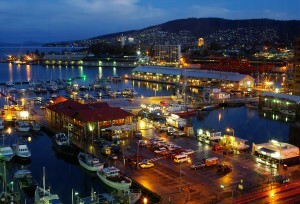 Hobart stands against a spectacular backdrop of mountains. The squat bulk of Mount Wellington looms to 1270 metres (4,166 feet) and beside it stands the equally imposing Mount Nelson. Their heights are often shrouded in clouds; in winter, snow crowns their peaks. The lowlands are a paradise for bushwalkers, and motorists can explore the heights via 20 km (12 miles) of roadway that twist up and around Mount Wellington. Colonial Relics: Old Hobart is a project to be tackled on foot. Abandon the car to explore such fine old haunts as Battery Point, still looking as it did a century or more ago. Historians say this area is Australia’s most complete colonial village. With its maze of old houses, uneven streets and quaint businesses, the district has the feel of an Old England or Maine maritime village. In a sloping park stands the gun battery which gave the area its name. A row of old sandstone warehouses along the waterfront at Salamanca Place was once the business headquarters for Hobart’s wealthy merchants who transported their wares via the tall sailing ships which once moored nearby. The point’s dominating edifice is St. George’s Church with its colonial spire and 19th-century box pews. New Town is an old inner suburb that developed as a village apart from the original town but has since been absorbed by Hobart. It contains many historic buildings including St. John’s Church, one of Australia’s oldest. Anglesea Barracks, the nation’s oldest military establishment still in use by the defence forces, is notable for its 18th- century naval guns and buildings which date back to 1814. History abounds in the city’s fine old buildings, many of which were erected by convicts. The lake in the grounds of Government House was formed when convicts quarried on the site to remove standstone used in the building of the Customs House, later to become Parliament House. In all, Hobart has almost 80 buildings that rate National Trust “A” classification, making the town a haven for students of colonial architecture. Tasmania is small enough that you can explore the whole island in a week – and still leave enough to keep coming back for more. See here for the joys of the north and west coasts – and Cradle Mountain. The one sight outside Hobart that everyone should visit is MONA, the Museum of Old and New Art, a brilliantly creative art gallery – though that doesn’t really do justice to a whole remarkable cultural experience.